THE PICKIEST EATER IN THE WORLD: MOCHIKO POTATO CHOCOLATE CHIP: A UNIQUE EXPERIENCE MADE EVEN MORE UNIQUE! 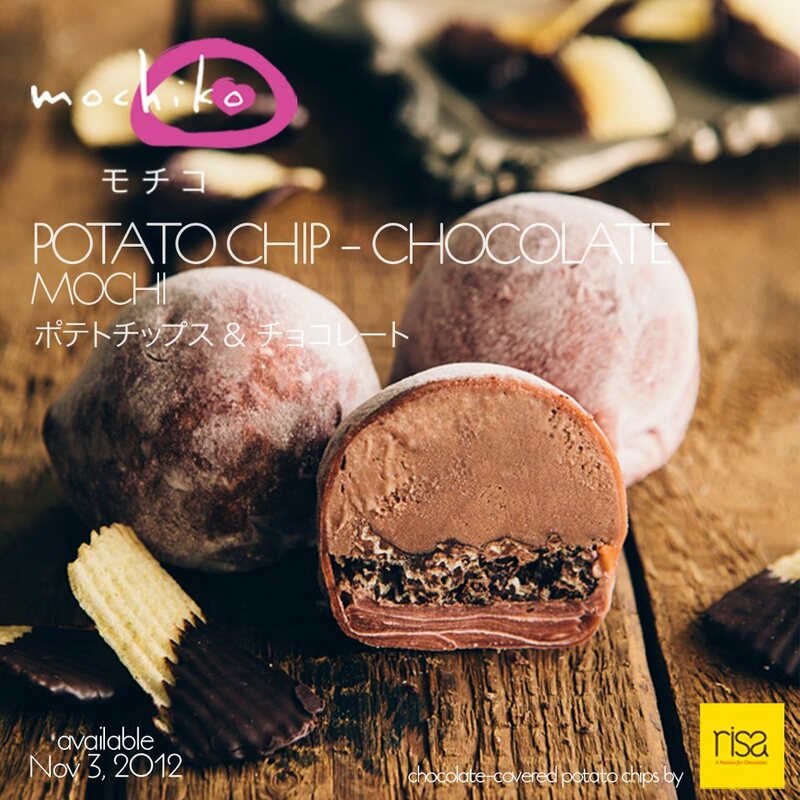 MOCHIKO POTATO CHOCOLATE CHIP: A UNIQUE EXPERIENCE MADE EVEN MORE UNIQUE! 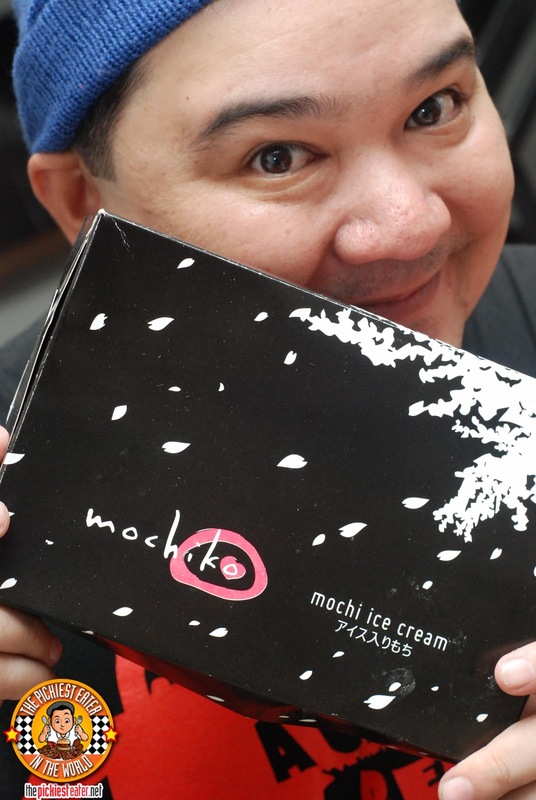 The first time I tried Mochiko Ice Cream was at Mercato Centrale a few years ago. It instantly became a favorite for Rina and I, and for as long as we pass by a stall, its very likely that one would be purchased. During the holiday season, I received a gift that I just had to share with you all. This was a Mochiko, but unlike any other I had tried before (and I've tried a lot, believe me). This was a box of their newest flavor, the Potato Chip Chocolate Mochi. In case you've never had a mochi ball before, it's basically a Japanese rice cake made with sticky rice and pounded until its so fine, it can be easily molded to whatever shape you want. 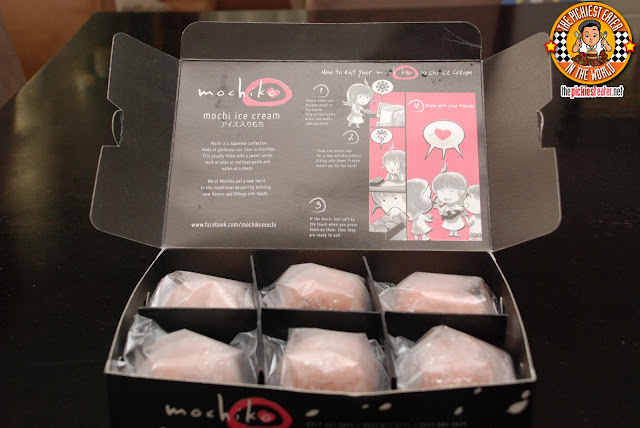 In the past few years, Mochi Ice Cream has gained popularity in the country, and with its wide selection of flavors and Mochiko has been at its forefront. In case you were wondering, no, that wasn't a typo. I did indeed type, "Potato Chip" Chocolate Mochi. I know it sounds strange. Truthfully, it sounded a little strange to me at first too. But I'll get to that a little later. The first thing I noticed the box. The design was was fun and creative, it was pretty much good to go as a gift! And it fit six pieces nicely, not to mention it came with a Japanese Manga cartoon on "How to Eat Mochiko". (It was fairly accurate except for the "share with your friends part".. Not gonna happen). It's imperative that you wait around 2 to 3 minutes for the mochi to soften a bit, otherwise you could be looking at a trip to the dentist the next day. Don't be a hero. I know it looks good, but it'll still be there three minutes later. And you can be positive that your teeth will be too. 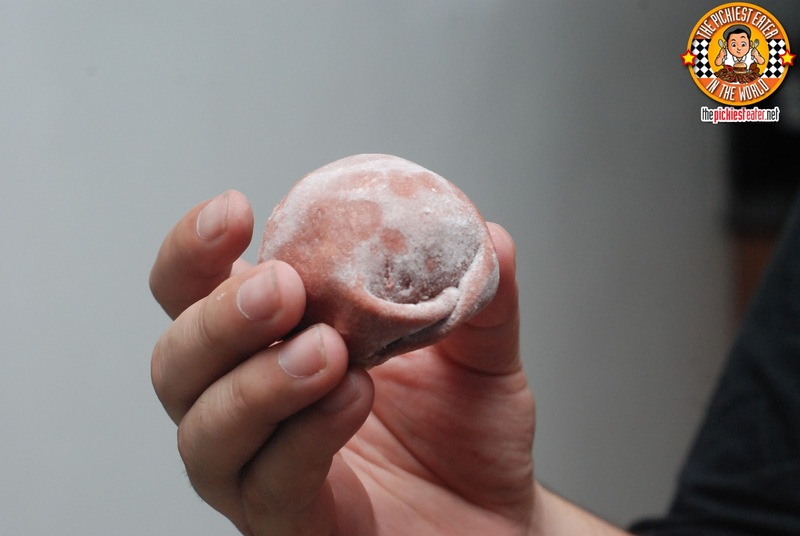 The Mochi had a smooth texture to it, which served as a unique casing to the ice cream. 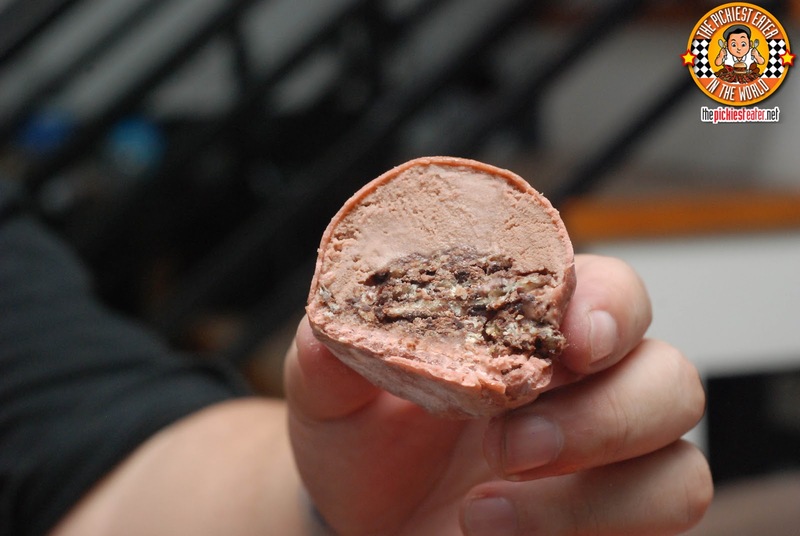 Once you get through it, a rich chocolate ice cream, with just the right hint of bitterness is revealed. You are then given a light crunch from the little treasure buried in the middle of it all.. the Chocolate Potato Chip from Risa's Chocolate. I will admit that when I first heard about it, I was skeptical about the chocolate potato chip as well. it definitely sounds unique and at the same time, a bit weird. But any doubts I had were alleviated when I found out that the Chocolate Potato Chip in question was made by Risa's Chocolates one of the finest chocolate makers here in the country. I used to see them often at Bazaars, and even Mercato Centrale (They actually still owe me a box of truffles from a contest I joined at Mercato Centrale that I was never able to collect hehe), but from what I tried of their stuff, I always enjoyed. When you're chowing down on that mochi ball, there's nothing that will help you distinguish the potato chip from a chocolate covered cornflake, so believe you me, there's nothing weird about it. This was in fact, extremely delicious, and though Rina and I agreed to split the box evenly, the final count became Rina 4 - Richie 2. I'm still debating which one I like more.. The Oreo Variant (Loyalist) or this! Regardless, You all should try this Unique Mochi experience! ah that shouldn't have been done. Cookie dough is yummy too! I tried it too. super love <3 my next fave is red bean then oreos & milk! haven't tried that yet! that'll be next on my list! Wow this looks good! Where can I find this? I've tried Mochi Cream's orange cheese mochi after raves by food blogs, pretty good. There are 24 flavors like apple pie, caramel macchiato, sakura etc, but this potato chip/oreo/red bean looks good!